High levels of computer technology in schools can improve attainment to an extent, a four-year study has found. The £34m ICT Test Bed project by computer agency Becta in three deprived areas of England showed gains in some GCSE and primary school test scores. Ofsted inspectors tended to disregard ICT, and computer use was inhibited by assessment methods, the study found. 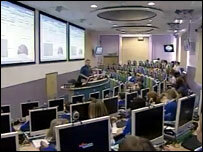 But Ofsted denied the report findings, saying its inspections highlighted the effectiveness of ICT. The study involved 23 primary schools, five secondaries and three further education colleges. These were in Barking and Dagenham, Sandwell and Durham - all areas of relative though different social and economic disadvantage. They drew up their own plans and were given money - totalling £34m - to spend on "high levels" of hardware, software and training. at Key Stage 1 (aged seven): "no significant differences"
post-16: little change - Test Bed students scored same points per exam but took fewer A-levels than comparators. The report says one of the reasons for the greater gains in primary schools may be that there was more scope for flexibility in the curriculum. The research also investigated teachers' concerns about Ofsted inspections. "There was a pattern of inspectors disregarding the use of ICT as an integral part of learning across the curriculum and, in some cases, not accepting evidence presented through ICT," the report said. "Clearly, in ICT-rich schools ICT is no longer 'merely' a curriculum subject but a vehicle for learning across the whole curriculum and this needs to be built into inspection criteria." Ofsted denied its inspectors disregarded the use of computer technology, and gave examples of school inspection reports that had highlighted the effective use of ICT to raise achievement. A spokeswoman said: "If Becta is concerned about the 11 schools their report refers to, we would welcome them sharing their concerns with Ofsted." Becta also said testing needed to change. This was illustrated by the significant gains that boys made in writing skills - a key weakness nationally - when they worked on computers. "Assessment practices, particularly the requirement to complete all examinations in handwriting, are not aligned with schools' increasing use of ICT for students' writing," the report said. Schools struggled to improve links with pupils' homes and to cater for those without computers or the internet. Schools had found it "hugely time-consuming", prohibitively costly in software and "fraught with problems". Over the past decade the government has spent almost a quarter of a million pounds per school on ICT - more than £5bn in all. An independent evaluation Becta published in January said teachers and pupils had found the introduction of ICT positive and motivating. "There has been a shift in the views of teachers, in particular, with initial scepticism and apprehension being gradually replaced by optimism and confidence." But it said: "At present the evidence on attainment is somewhat inconsistent, although it does appear that, in some contexts, with some pupils, in some disciplines, attainment has been enhanced." Schools Minister Jim Knight said: "The Test Bed project demonstrates just how ICT has the power to transform young people's learning - both at school and beyond the school gate." He added: "We will be looking to capitalise on this project and replicate it across the country."